What is Big Google Onpage SEO Changes in 2018 ? 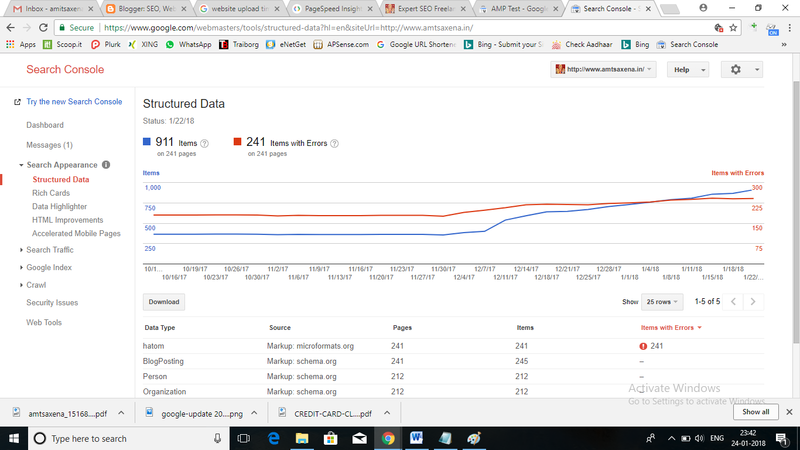 Are you aware of latest Google OnPages SEO changes in 2018 that happened gradually last months or some months before? It's not Google majors changes or any algorithm changes but I personally cared some changes in Google search result. After these updates some website lose keyword ranking in Google search result and some website boost keywords ranking in Google search result. So lets know here what are the major changes of Google in 2018 and how to recover or boost your ranking in Google once again. If you are new website owner or blogger then take care of the following things next time when you are going to design and develop the new website. If you are blogger then you must do some major Onpages Changes in your Blog. There fore don't waste time and let's start one by one tips of Google SEO changes. 1. Google Changed the Meta Description Char Limits - I think it is the biggest changes of Google search engine result. Now we can see the description of 300 to 320 chars in Google Search result instead of 155- 165 chars. So if your website or blog have 155 to 165 chars meta descriptions then you should changes it 300 to 320 chars. Takes care of the meta description quality and uniqueness. If you increase the meta description then you might achieve good ranking now. So I suggest you that now; write long meta descriptions and get better result than before. 2. Fast Upload Speed of Website in Mobile and Desktops - Some month before Google official declared that website speed should upload on mobile and desktop too fast as much as possible. So check the speed of website uploading time in Google and improve the website or blog speed. You website upload fully within 2 to 5 second only. If your website uploading timing more than 6 sec it means you are loosing web traffic and google ranking also. So measure the Google website loading score here . If your score more than 80/100 then your website loading is good condition and you don't need to worry about it. If you score is more than 60/100 then you should try to improve it and increase above 75/100. 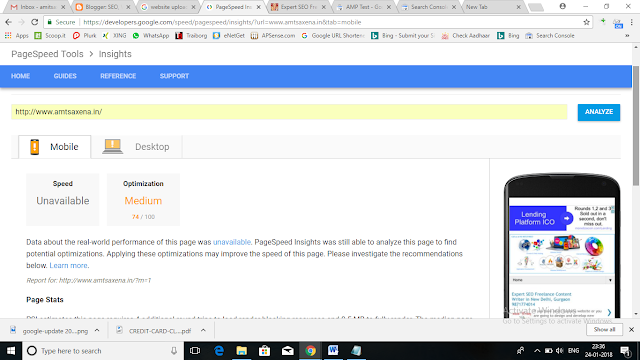 If you score less than 60/100 then you must approve the website loading time, otherwise you definitely lost your Google ranking day by day. Google also suggest you how to improve your uploading speed. So check in tool and click on Google suggestion link to improve your speed. Here I would like to finally say you that; you must improve the website uploading time if you want to get top ranking in Google search result. If you don't know how to improve the speed of website then you can hire freelance web developer at lowest price and make improvement of your website. 3. 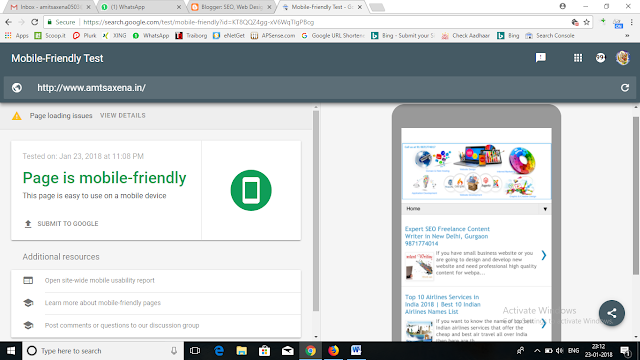 Mobile Friendly Website - It is also one of the biggest Google SEO onpage ranking factor in 2018. If your website is still not mobile friendly then you must develop your website mobile responsive. You know well about 60% people search the queries on mobile phone these days. So your website should be mobile friendly first. Google also consider mobile friendly website ranking first than not mobile friendly website. So check here your website or blog is mobile friendly or not . If your website is not mobile friendly then hire expert mobile responsive website developer and make your website fully mobile responsive first then you do further things. other wise you can't get good rank in Google search result. 4. Mobile AMP - Mobile AMP is also important for website . It is not mandatory but if you want to better result then your website or blog should be Mobile AMP friendly. It help to upload fast in mobile and the possibility in Mobile ranking is increased. You know well mobile user is more than desktop user and a lots of queries are searched on mobile so you should develop mobile AMP friendly website. To check mobile AMP visit here. 5. Fix the Data Structure Issues - Google Search Engine is not a human. The search result is done by robots and robots work on various mathematical algorithm that is developed by Google Engineers. Google suggest that tell Google Robots what type of data on your website. Read here about Data Types that Google Support . So tell the Google search robots what types of data on your website and make your site more search engine friendly. If you define data types of your website and submit to Google then your website ranking boost rapidly and you can achieve top ranking in Google search result. If you don't know how to fix Data structure of your website then hire expert SEO freelancer and fix this issues. If you website is eCommerce then you must follow this guidelines. If you fix these above issues in your website then your website must visible in Google Search Result. These are the main SEO onpage factors in 2018. After fix these problem start offpage for your website. You should the following work activities for better result in Google. 1. Write unique and quality web content about 400-600 words. 2. Start to create Good back links for your website. 5. Share on Social Media site and many others. Hope you like this suggestion. Labels: What is Big Google Onpage SEO Changes in 2018 ?